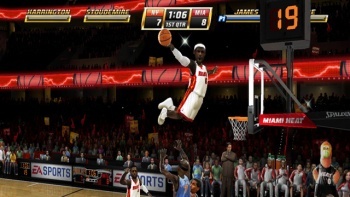 A posting on the ESRB's website reveals that EA's remake of the arcade slam-dunk NBA Jam will let players shatter backboards on all three of the current-gen systems. Nostalgic gamers were understandably excited when Electronic Arts announced a remake of Midway's cult classic arcade basketball game, NBA Jam, for the Wii. A certain segment of that fan base has been clamoring for high-definition versions of the remake, but EA has been surprisingly cagey on the subject. Still, despite the lack of comment from the publisher, evidence has appeared on the websites of multiple game rating boards that the basketball title will show up on all three of the current home consoles. A few weeks ago, the German USK ratings board mentioned Xbox 360 and PS3 versions of the game, and now, a similar listing has appeared on the website of the American rating board, the ESRB. A search in the ESRB's database reveals two entries for the upcoming game, one for the Wii and one for both the Xbox 360 and PlayStation 3. Both entries share a common content summary and rating, "E for Everyone." Electronic Arts has yet to comment on the listing, but with confirmation from two different ratings boards, it seems likely that high-definition ports of the Wii remake are in the works. It seems likely that the initial Wii version will be a timed exclusive, but gamers without a Wii could be playing the game on their Xbox or PS3 early next year. For gamers that have never played the older NBA Jam titles and have no idea what all of the excitement is about, the ESRB's description summarizes the game nicely: "This is an arcade-style basketball game in which players can select teams from the official NBA roster to compete in 2-on-2 games of basketball. Players can perform exaggerated slam dunks, shatter backboards, and try to conquer a series of unique 'JAM Challenges.'"